Julius MERTEN was born the 20th of March, 1860 in Trenton, Clinton County, Illinois, the son of Edward and Josephine (Hanke) Merten. He died the 22nd of January, 1947, the age of 86 years, 10 months and 2 days, at his home, Merten Cottage, 334 South Castle Avenue, Salem, Illinois. Julius' feneral was held Friday, 24 Jan 1947, 2:00 p.m., Hancock Funeral Home and burial was in East Lawn Cemetery in Salem, Illinois. 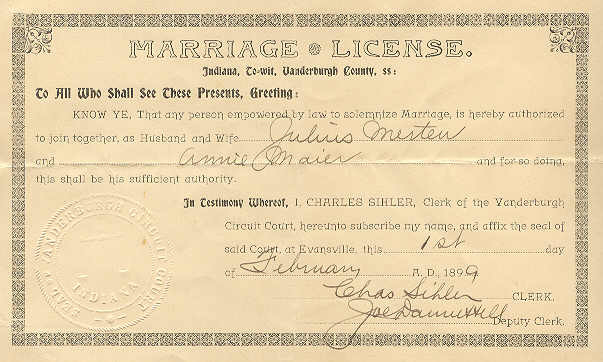 Julius married Anna "Annie" MAIER the 1st of February, 1899, Evansville, Vanderburgh County, Indiana. She was born the 24th of July 1871, German Ridge, Perry County, Indiana, the daughter of Johann Peter "John" and Margaretha Magdalena "Margaret" (LEISTNER)(MANN) MAIER. Annie died the 22nd of September, 1925, during surgery for a goiter, Engalls Memorial Hospital, Harvey, Cook County, Illinois. She is buried next to Julius in East Lawn Cemetery. Julius was born in turbulent time, the beginning of the American Civil War, a war that spared few families. Folrtunately the war did not take any of our Merten Family, even though Julius' Uncle Herman Merten, of Sandoval, Illinois, was a sergeant in the war. Julius was raised on his father's farm in Meridian Township, Clinton County, Illinois, which was near Shattuc. His father moved there when Julius was one year old. Julius' forst job away from his father's farm was that of a bookkeeper and weighmaster in his uncle's mill, Uncle Joseph Hanke, in Trenton. 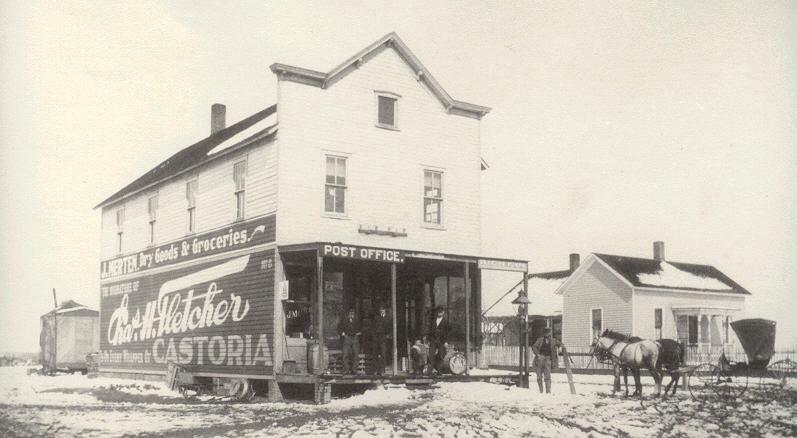 In 1887 he moved to Shattuc and became a clerk in Henry BOYER's store, which was the first store in Shattuc. Julius later built a two-story building west of the creek and opened his own store. J. MERTEN, Dry Goods & Groceries. He also had the first lumber yard in Shattuc. The post office was located i his store. He served as postmaster from 1893 to 1897. The second floor of the store was used as the community center of Shattuc. Julius held the offices of Town Clerk, School Treasurer, and Treasurer of the Odd Fellows and Modern Woodman Lodges. Julius lived in the Boyer Hotel from 1892 until his marriage in 1899. Julius met Annie when she was in Shattuc visiting her cousin, John MANN, and family. John MANN, her mother's nephew, had moved to Shattuc in 1885 from Santa Claus, Indian. He purchased the blacksmith shop from Mr. HOPFINGER and was the town's blacksmith unti his death in 1930. His son, Asa MANN, built a new blacksmith shop and garage in 1926, bringing Shattuc into the modern age of mechanics. Asa was also a Studebaker agent until his retirement in 1950. Julius and Annie married in Indian, near her family. They then returned to Shattuc, whre Julius had built a new house next to his store. Annie spent so much of her time in the store helping Julius, that she hired a maid to do her housework. Julius Merten Store and Home in Shattuc. 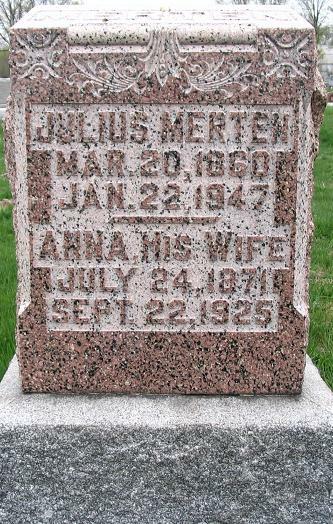 On 19 Jun 1900, the census shows Julius and Annie MERTEN living in Meridian Township, Clinton County, Illinois. Living with them was their daughter, Beatrice MERTEN age 6 months. 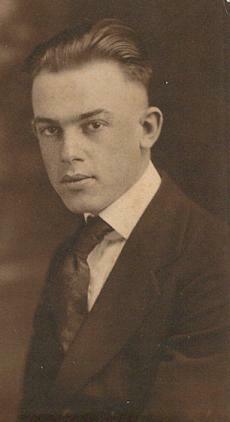 Also living with them was Julius' brother, Frank MERTEN age 25. The census shows that Julius owned his home and it was free of morgage. He is listed as a merchant. Uncle Frank was lilsted as a clerk in a dry goods store. In 1909, Julius and Annie sold their store to O. C. KEISTER and Fred WOLLENWEBER. The name of the store was chnged to WOLLENWEBER & KEISTER. Julius moved his family to Salem, the next county east, Marion County, Illinois, about 30 miles east of Shattuc. He went into business with Mr. HANES. They had a Confectionery on the south side of the 100 block of West Main Street in Salem. He later had a grocery store on the 100 block of South Rotan in Salem. In Mar 1914, Julius and Annie bought the Lemen House at 321 South Franklin Street in Salem, where they had been living since 1909, when the moved to Salem. The Lemen House had been built in 1842 (Photo taken in 1958.) for Rev. 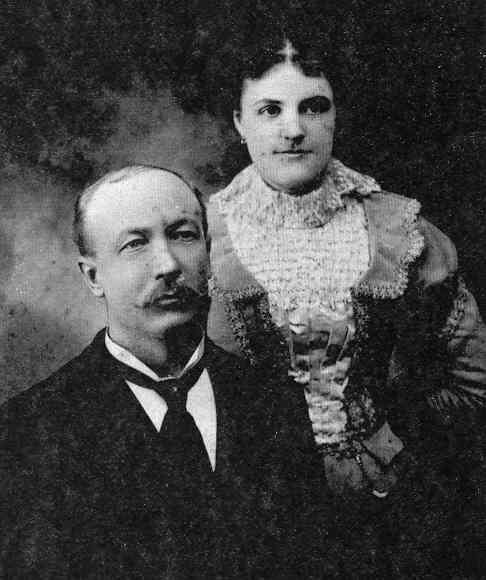 Benjamin F. LEMEN and his wife, Mary Putnam (RAND) LEMEN. The Lemen's were a very distinguished family in Illinois. They were friends of President Abraham LINCOLN, who visited them on several occasions in their home before he went to Washington D.C. as our 16th president. Mrs. LEMEN founded the Southern Illinois Female Adacemy in Salem. The LEMEN family founded the first Protestant Church in Illinois (Baptist). Mrs. LEMEN was the niece of General Israel PUTNAM and the great-granddaughter of General GOFF of the French-Indian War. The LEMEN's daughter, Lydia Gertrude LEMEN, married in this house to Count John SOBIESKI, Prince Royal of Poland, and heir to the throne of Poland. The house consisted of four bedrooms and a bath on the second floor and on the first floor was a kitchen, dining room and parlor. There was, by this time, a large front proch across the entire front of the house. As you went into the front door, there was the stairway and a long hallway that led to ta back door, to the back porch. There was full first and second floor back porch which had an outdoor stiarway from the first floor to the second. The property also included a sumer kitchen and a guest house. He sold the house in 1915 to his sister, Rosa Francois, and family. His daughter, Bea and husband later bought this house in 1941 and it remains in the Frakes Family to this day (2002). 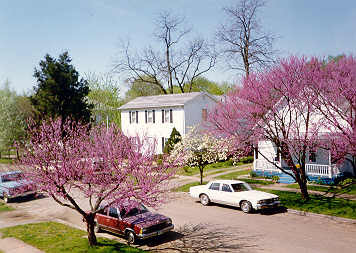 This photo of the Lemen-Frakes House was taken in the spring of 1994. It was taken from the 2nd floor window of the house across the street, then owned by cousin Jackie Lee (CLOUD) WILLIAMS. I love the spring when all the redbud trees are budding. Julius moved south of Salem and bought a farm house, south of the missouri and Illinois Railroad. He remained in the confectionery business, but also had some chickens and stock. He only lived there a short while and wanted to move back into town. He moved back into Salem and bought the guest house back from his sister, along with the summer kitchen. 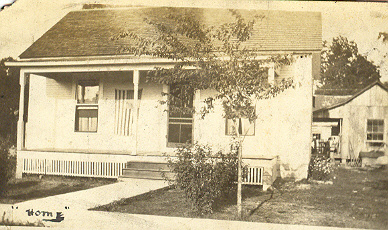 (In the photo at left you can see the house during WWI, with flag on front porch. Also, the summer kitchen had not been added to the house yet, as you can see it to the right of the house.) He added the summer kitchen to the back of the house sometime later. This house is at 334 South Castle, directly behind (west) of the Lemen-Frakes House. On 6 Jan 1920, the census shows Jay (59) and Anna (48) MERTER living at 334 South Castle Avenue, Salem, Marion County, Illinois. Living with them were their children Beatrice MERTEN age 20; Morris MERTEN age 17; Eunice MERTEN age 10; Floyd MERTEN age 14; and Clyde MERTEN age 12. They owned their home, but it was morgaged. Julius was listed as a laborer at a seed barn. Beatrice was a clerk at a restaurant. Morris was a call boy at a despatcher's office. 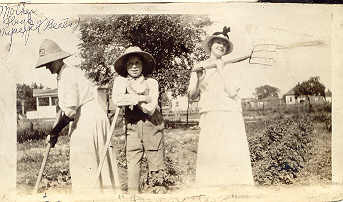 Annie always kept a garden and here she is getting help from children, "Bud" and "Bea." Of course, Bea was more into posing for photos than tending a garden. Julius planted a grape arbor behind Merten Cottage. He would make homemade wine from the concord grapes. They also made wonderful grape jelly. This grape arbor is still there today (2003) and still produces wonderful grapes. Grandmother Bea recieved her schooling in Salem. She did quit high school during WWI because they dropped German from the cirriculum. She thought it was stupid to not teach the language of the country you were fighting. Also, she was German-Jew and was proud that her family came from Germany. Here is a photo of her in school. On 3 Jul 1924, because the economy was not good in Salem during the 20's, Julius and Annie moved to Harvey, Cook County, Illinois, a suburb of Chicago. He kept his house in Salem and rented one in Harvey. Their children, Eunice, Floyd and Clyde moved with them. They all hated Harvey and missed Salem greatly, but Julius was able to find a job so they remained. The landlady was very unfriendly. Wensday morning. I am sitting up this morning. Will write you how everything is here I am alright but as thin as a rail so weak cant walk alone to see Bud he is in the 3rd ward from me The nurse take me to him in the weelchair. Was to see him 3 time havent been to see him yet this morning They are so bussy several operations ar going on this morning a lady from our ward is going to take a ride soon This is a life Hospital life I say. I don't want to come back If I ever get out her. Bee I am her almost 3 weeks and will be here another week if I take the operation I don't know what to do yet today. i think about the expens taks us the rest of our lives to pay if I improved. what is to be wil be. That is the old saying anaway. Annie died six days later while being operated on. On 3 Apr 1930, the census shows Julus MERTEN age 70 living on Center 153rd Street in Harvey Cook County, Illinois. 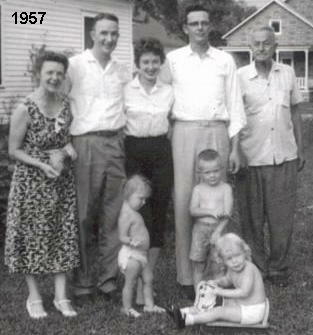 With him were his children Clyde MERTEN age 22; Eunice HICK age 26; Floyd MERTEN age 24; and Lois HICK age 3. Julius was renting and the rent was $36.00 a month. He owned a radio. Julius was employed as a watchman. Floyd was a Hammerman at a Steel place. The photo at right was taken in Harvey. 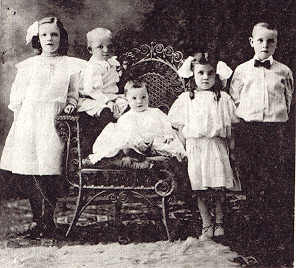 Left to Right: Julius MERTEN, Eunice (MERTEN) HICKS holding Lois HICKS, William Randolph FRAKES, William Philip FRAKES, and Maurice MERTEN. Julius retired in 1935 and returned to his home in Salem. And there he lived out the remaining years of his life. 1. Beatrice Margaret Julietta "Bea" MERTEN, born 1899. 2. Maurice Russell MERTEN, born 1901. 3. Eunice Elva MERTEN, born 1903. 4. Floyd Howard "Bud" MERTEN, born 1905. 5. Clyde Erwin MERTEN, born 1907. Beatrice Margaret Julietta "Bea" MERTEN, born 13 November 1899, Shattuc, Clinton, County, Illinois. She died 23 October 1985, Salem, Marion County, Illinois. Bea and Bill are both buried in East Lawn Cemetery, Salem, Marion County, Illinois. Bea married William Philip "Bill" FRAKES 31 January 1924, Vandalia, Fayette County, Illinois. He was born 10 May 1890, Prairie Creek, Vigo County, Indian, son of Francis Marion and Hannah Margaret C. (ARTHUR) FRAKES. He died 14 February 1965, Veteran's Hospital, Marion, Williamson County, Illinois. On 5 Apr 1930, the census shows William P. (35) and Beatrice M. J. 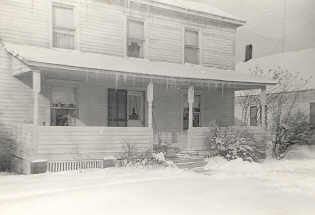 (30) FRAKES living at 334 South Castle Avenue, Salem, Marion County, Illinois. With them were their sons William R. age 4 years and 5 months; and Philip H. age 1 year and 2 months. They were renting, paying $20.00 a month. William was a conductor on a steam railroad. The photo above and right, is the William P. and Beatrice M. J. (MERTEN) FRAKES family. Left to right: Beatrice, Philip, Judy, Bill and Bill, Sr. The children in front, left to right: Cyndy Thurman, Mark Frakes and seated is Tanya Frakes. 1. William Randolph "Bill" Frakes, born 2 Nov 1925, Salem, Marion County, Illinois. Bill died 17 Jan 2011, St.Louis, Missouri. 2. Philip Howard "Phil" Frakes, born 25 Feb 1929, Salem, Illinois. He died Friday, 16 Sep 2005, Salem, Marion County, Illinois. Judy married Howard Galloway Thurman, Jr., born 21 May 1934, Salem, Illinois, son of Howard Galloway and Ethel E. (Berg) Thurman. Howard died 6 Jan 2011, Bakersfield, Kern County, California. 1. Marsha Lynn Frakes, born 27 Mar 1949, Salem, Illinois of Bill & Betty. 2. Mark Alan Frakes, born 10 Feb 1954, Cario, Illinois of Bill & Betty. 3. Tanya Rae Frakes, born 7 July 1955, Highland, Illinois of Phil & Monna. Tanya died 23 January 2010, Salem, Marion County, Illinois. 5. Stephen Philip Howard Frakes, born 2 October 1957, Highland, Illinois of Phil & Monna. 8. Terri June Frakes, born 22 April 1962, Highland, Illinois of Phil & Monna. 5. Trent Maurice Adams, 5 Dec 1982, Centralia, Illinois. 7. Brock Richard Adams, 26 Sep 1985, Centralia, Illinois. 8. David Philip Anthony Belfiore, 18 Oct 1985, Orlando, Florida. David Philip married 1st Samantha Jean Daniels 14 March 2009, Salem, Marion County, Illinois. David Philip married 2nd Andrea Morlan 19 Oct 2013, Las Vegas, Clark County, Nevada. 9. Brooke Nicole Thurman, 19 Mar 1986, Fresno, California, daughter of Van and Terri. Brooke married Kevin Trent Bratcher 28 Apr 2012, Hawaii. 10. Nicole Elise Thurman, 9 Jan 1989, Bakersfield, California, daughter of Van and Terri. Nicole married Jack Joseph Campbell Jan 2011, Bakersfield, Kern County, California. 11. Daniel William Eli Belfiore, 3 Feb 1992, Belleville, Illinois. Daniel married 1st Erica Amber-lynn Casner. Daughter of Nikki Casner and Terry L. Garren. 12. Jourdan Darlene "Jourdy" Thurman 15 Aug 1996, Bakersfield, California, daughter of Trey. **. Jillian Rebecca Riley, born 21 Sep 1992, Beaufort, South Carolina, Stepdaughter of Nathan Courtright. 4. Jacob "Jake" Cannon, born 2006, Bakersfield, Kern County, California, son of Tyler. Son of Tyler. 5. Brooklyn Cannon, born Sep 2007, Bakersfield, Kern County, California. Daugher of Riley. 6. Reece Daniel Cannon, born 21 Dec 2007, Bakersfield, Kern County, California. Son of Tyler. 12. Cameron Bennett Cannon, born 24 Jun 2010, Bakersfield, Kern County, California, son of Tyler. 20. Grayson Leo Adams, born 17 Aug 2015, Effingham, Effingham County, Illinois. Son of Brock & Lauren. 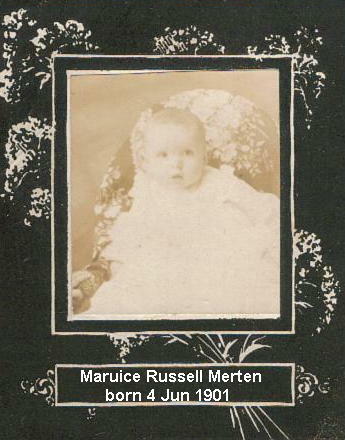 Maurice Russell MERTEN, born 4 June 1901, Shattuc, Clinton County, Illinois. Maurice died 13 December 1978, Sterling Heights, Michigan. Maurice and Laverne are buried in Royal Oak Cemetery. Maurice married Laverne INGLEY 3 September 1929, Detroit, Michigan. She was born 28 April 1907, Port Huron, Michigan, daughter of Lewis and Emma (PUTNAM) INGLEY. Laverne died Jan 1984. Last place of residence was Romeo, Macomb County, Michigan. On 14 Apr 1930, the census shows Maurice (28) and Laverne (23) MERTEN living Van Dyke Avenue, Detroit, Michigan. They were renting at a cost of $60.00 a month. They owned a radio. He was employed as an auto trimm at an auto factory. Laverne did clerical work for the railroad. Maurice worked for Stroh's Beer for 33 Years. They were Presbyterian, both of their children being baptized at the Presbyterian Church on Grand River in Detroit, Michigan. The two photos at right are Maurice. 1. Karen Anna MERTEN, born 15 January 1933,Detroit, Michigan. She married 1st Sonny PHIPPS. She married 2nd Richard WILLIAMS. Married 3rd Charles OTTENBACHER. 2. Keith Maurice MERTEN, born 6 Dec 1935, Detroit, Michigan. He married Mary Margaret DUHART 22 Oct 1960. She was born 27 Aug 1935. 3. Lisa Ann MERTEN, born 8 February 1962, Dearborn, Michigan. She married Donald Frank SHERMAN 9 Oct 1987. He was born 28 Apr 1963. 4. Barbara Kay MERTEN, born 20 February 1963, Dearborn. She married David Andrew DUBENSKY 19 Jun 1987. He was born 8 Sep 1963. 5. Thomas Christopher MERTEN, born 17 February 1965, Detroit, Michigan. He married Rosemarie HANLON. She was born 8 May 1961, Riverview, Michigan. 6. John Anthony MERTEN, born 16 February 1968, Warren, Michigan. 1. Alexander Douglas SHERMAN, born 4 Feb 1994. 2. Julia Rose SHERMAN, born 24 Sep 1996. 3. Amanda Clair SHERMAN, born 20 Aug 2000. 4. Jack Thomas MERTEN, born 31 Jan 2002, Royal Oak, Michigan. Son of Thomas and Rosemarie. 5. Peter Joseph MERTEN, born 7 Apr 2004, Royal Oak, Michigan. Son of Thomas and Rosemarie. 6. Molly Margaret SHERMAN, born 16 Apr 2004. The Keith and Mary Merten Family. Photo taken Dec 2007. 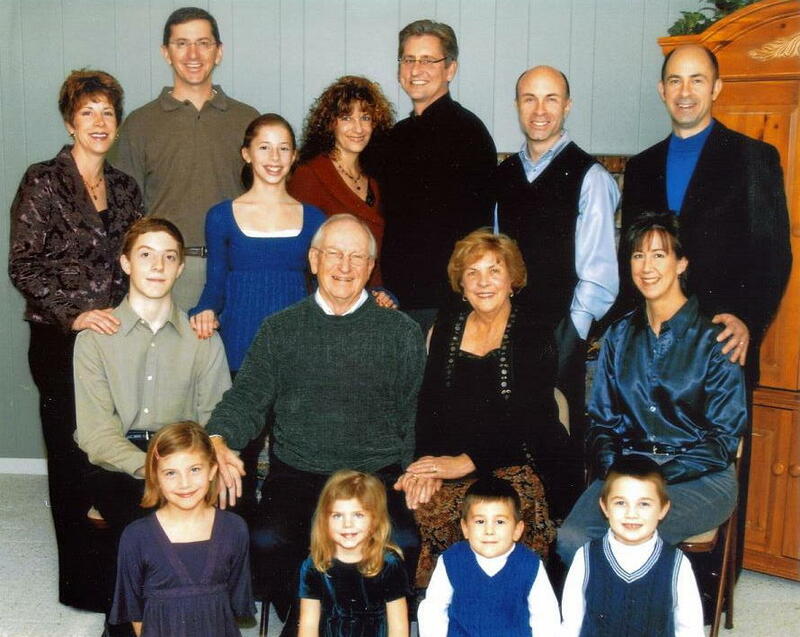 Back Row Standing, left to right: Lisa (Merten) Sherman, Don Sherman, Julia Sherman, Barbara (Merten) Dubensky, David Dubensky, John Merten and Thomas Merten. 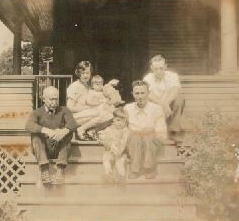 Middle Row Seated, left to right: Alex Sherman, Keith Merten, Mary Merten and Rosemarie (Hanlon) Merten. Front Row Kneeling left to right: Amanda Sherman, Molly Sherman, Peter Merten and Jack Merten. Eunice Elva MERTEN, born 12 June 1903, Shattuc, Clinton County, Illinois. She died 17 July 1983, Salem, Marion County, Illinois. Aunt Eunice married Earl Travis HICKS 22 Sep 1924, Harvey, Cook County, Illinois. They divorced. Eunice lived the first six years of her life in Shattuc, where her father was the local merchant. In 1917, they moved to 334 South Castle Avenue. In 1924, her parents and two younger brothers moved to Harvey, Illinois. They kept their house on Castle in Salem. After Julius retired, they moved back to Salem and Eunice lived the rest of her life at 334 South Castle. On 1 Dec 1925, Eunice wrote the following letter to her sister, addressed: Mrs. William FRAKES 421 N Broadway Salem Ill., "Harvey Ill Dec 1, 1925 Dear Sis How is everyone feeling after the Thanksgiving holiday? Did you have Turkey! We received a letter from Maurice yesterday and he, Shorty, Reeden and Jack Huses had a Turkey dinner given by their landlady. Travis and I went to Chicago Saturday afternoon and I bought a new coat. It is black Bolivia with fox fur cuffs and collar and it has a flease bottom. I like to buy in the city as there is such a large variety to choose from. How is Junior? Does he cray as much as you did when a baby. Bee, did you know that Jesse's father in law was working here in Harvey? He is working at the Austin in the same department that Dad is working. He said he knew you when you worked at Garby's. Dad has another job now, in the motor sweeper department. It is lighter work. We received the money order for twenty-two dollars and next time just send eighteen. I have been busy all week straightening the house. We moved last Monday and it is some job. I think this will be the last move, and if we have to move again we are going to sell out. Are you coming up Christmas? It seemed like Christmas the last few days as the ground was covered with snow. Well Bee, I must close as I want to scrub the kitchen and wash my hair. There is always something to do. Write soon. Love Eunice 15238 Lexington Ave."
On 3 Apr 1930, the census shows Eunice HICKS age 26 and her daughter Lois HICKS age 3 living with Eunice's father Julius MERTEN age 70 living in Harvey, Cook County, Illinois. 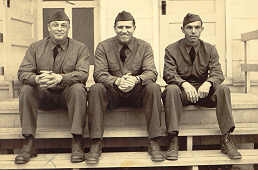 Also there were Eunice's brothers Floyd MERTEN age 24; and Clyde MERTEN age 22. Their rent was $36.00 a month. Julius� was listed as a watchman. Floyd worked at the steel works. 1. Lois Maxine HICKS, born 26 Aug 1926, Harvey, Cook County, Illinois. She died 29 Mar 2004, Salem. She married Val Jean HUDGENS. 1. Brenda Jane HUDGENS, born 29 September 1950, Salem, Illinois. Brenda married Steve LOEW. 2. Norman Eugene HUDGENS, born 22 June 1954, Salem, Illinois. Norman married Karen Jean RICHISON. 3. Patricia Kay "Trish" HUDGENS, born 15 July 1955, Salem, Illinois. Trish married Bret JEZEK. 1. David Val HUDGENS, born 22 Nov 1975, Mt. Vernon, Illinois. David married Stephanie McWHORTER 2007. 2. Gary Michael GARICH, born 13 Sep 1977, Centralia, Illinois. Gary married Amanda Kay DANIELS 2007. 3. Joel Arthur HUDGENS, born 15 May 1979, Mt. Vernon, Illinois. Joel married Marie KARRICK. 4. Cole Edward JEZEK, born 28 Jul 1985, Centralia, Illinois. 5. Rebecca Jane JEZEK, born 10 Feb 1987, Mt. Vernon, Illinois. 1. Joel Blade HUDGENS, born 7 Sep 1997, son of Joel. 2. Ashley Marie HUDGENS, born 30 Jun 2005, daughter of Joel. 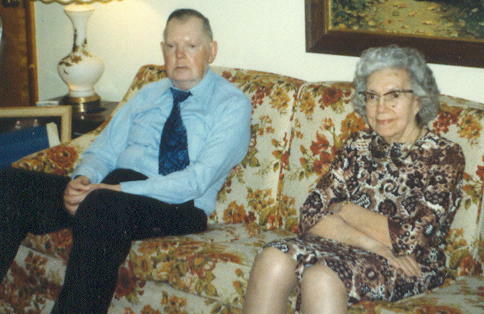 Clyde Merten and Eunice (MERTEN) HICKS. Floyd Howard "Bud" MERTEN, born 12 May 1905, Shattuc, Clinton County, Illinois. He died 20 January 1972, age 66 at his home in Harvey, Cook county, Illinois. He is buried next to his parents, brother Clyde and sister Eunice in East Lawn Cemetery, Salem, Marion County, Illinois. Bud served in the United States Army during World War II, in the European Theatre, where he was wounded. He was greatly loved by his brother and sisters, nephews and nieces and friends. A man with great personality. He really enjoyed life. In the photo, Bud is the one on the left. Clyde Erwin MERTEN, born 5 October 1907, Shattuc, Clinton County, Illinois. He died 13 August 1990 at his home, Merten Cottage, where he had lived most of his life in Salem. He is buried next to his parents and brother Bud and sister Eunice in East Lawn Cemetery in Salem. He was employed at Bachmann's Furniture Store until his retirement. He was a very gentle and quiet man. He always kept a vegetable garden. He also made wine from his backyar vineyard. Front Row, left to right: Uncle William Randolph "Bill" Frakes, Aunt Betty Jean (Hammer) Frakes, Madison Jaye "Madie" Courtright, Monna Marilyn (Conant) Frakes, Stephen Philip Howard Frakes, Marsha Lynn (Frakes) Bagley, Myleigh Rose Clutts, Jennifer Leigh (Bagley) Clutts, William Kelby "Billie" Clutts. Middle Row, left to right: Brock Richard Adams, Terri June (Frakes) Adams, David Philip Anthony Belfiore, Samantha (Daniels) Belfiore, Norman Eugene Hudgens, Patricia Kay "Trish" (Hudgens) Jezek, Karen Jean (Richeson) Hudgens, Brenda Jane (Hudgens)(Garich) Loew, Timothy Paul "Tim" Bagley. Back Row, left to right: Nathan Roddy Courtright, Riley Cecil Cannon and Cynthia Tenae "Cyndy" (Thurman) Cannon. Not pictured: Angie Courtright (who was taking the photo); and Steve Loew and Gary Garich, both of whom had left before the photo was taken. There were more conventional photos taken, but I like this one where we are laughing, as it shows us more like we really are. The Salem, Marion County, Illinois Yahoo Group has genealogies and many old photos of Salem, Illinois and many old pictures of some of the families of Salem. There is a file section for histories and genealogies of Salem. There are photo albums for you to place your own photos of your family. You can also place your own family genealogies in the file section. 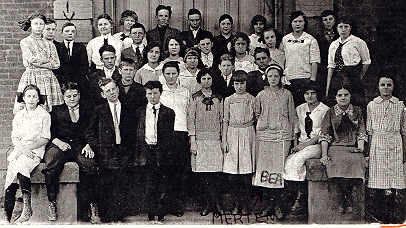 The Meridian and East Fork Townships Yahoo Group has genealogies and many old photos of Shattuc, Illinois and many old pictures of some of the families of Meridian and East Fork Townships. There is a file section for histories and genealogies of East Fork and Meridian Townships. There are photo albums for you to place your own photos of your family. You can also place your own family genealogies in the file section. Copyright © 2004-2017 stephenfrakes All rights reserved.